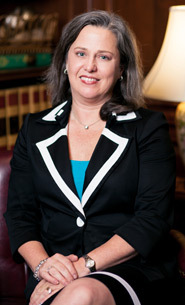 Kristine has practiced law since 1995 and has extensive experience in all aspects of residential real estate. A native Atlantan, Kristine attended The Westminster Schools of Atlanta, Furman University and California Western School of Law. She returned to Atlanta after graduating from law school in San Diego – she missed her family and the seasons. Kristine represents builders, homebuyers, homeowners and lenders regarding title issues, contract preparation and review, easements and other agreements related to land, acquisition and development, purchase money loans, refinances, and corporate relocations. She has closed over 10,000 transactions. Kristine also assists clients in the preparation of limited liability companies and corporations. She has served on the Board of Directors of the “Georgia Real Estate Closing Attorneys Association” since 1997 and was President 2006-2007. She works with attorneys in Georgia to protect consumers involved in residential real estate transactions. She is also a member of the Georgia Bar Association (Real Property Section), the Atlanta Bar Association, the Georgia Association for Women Lawyers, the National Association of Professional Mortgage Women and the National Association of Women Lawyers. Kristine enjoys outdoors activities such as camping, hiking, and gardening. In addition, Kristine loves to cook and appreciates a fine bottle of wine. She is a member of the Atlanta Chapter of the Chaine de Rotisseurs, an International Food and Wine Society. Kristine is married to fellow lawyer, James Cavin. They love to hike and camp with their three wonderful young boys and two large dogs. Kristine and her husband are also very involved in the Cub Scouts and other activities of their children. Suzanne Hayes, Director of Operations - Nead Werx, Inc.